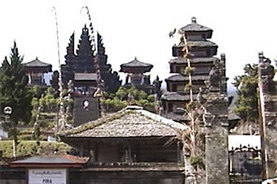 Amed is in the regency of Karangasem, the province has a rich variety of scenic landscapes. Low and high mountain ranges intermingle with upland plain, tropical forests, teracced rice fields, beautiful beaches, culture and history. 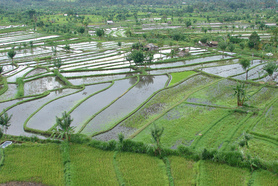 Geria Giri Shanti Bungalows is situated in Jemeluk, the central village of the Amed coastal region. The area offers peaceful bays, clear waters and dramatic topography. Whilst tourism is growing the majority of the inhabitants of the village live mostly from fishing and the production of sea salt. Our location provides easy access to many amenities, a selection of local restaurants 'warungs', a well provisioned shop and a spa are all within easy walking distance. More 'up market' dining options are also available. 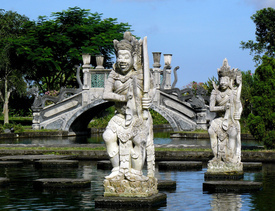 Encounter the real Bali, enjoy the local hospitality and choose from a large selection of restaurants. Experience romantic cliff-top dinners, beachside warungs and bars with live music by local bands. 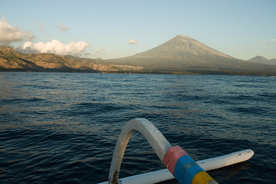 Amed is also known for having the most beautiful coral reefs in Bali which means that snorkeling and diving are amongst the most popular activities in the area. Other available activities include hiking, cycling and trying your hand at fishing from a traditional 'Jukung' boat and hopefully encountering a pod of dolphins. 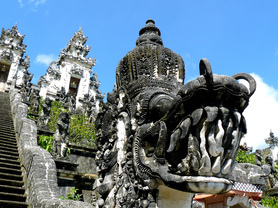 We can assist you in hiring scooters, drivers and guides to explore this majestic region. 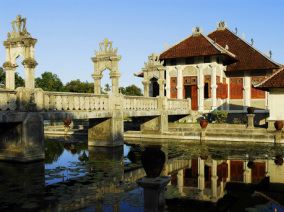 We can also organise onward travel to the Gili islands and Lombok.